Step off the beaten path and head to Seurasaari Island and Open-Air Museum and Aurinkolahti Beach. 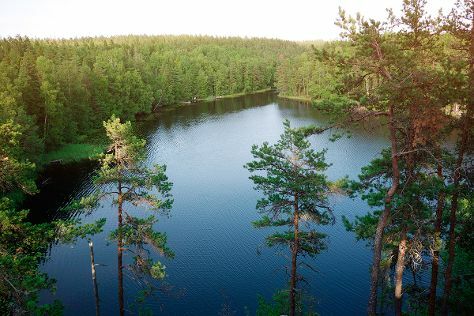 Get in touch with nature at Nuuksio National Park and Hietaranta Beach. Explore the numerous day-trip ideas around Helsinki: Porvoo (Porvoo Old Town & Cathedral of Porvoo), Sipoonkorven Kansallispuisto (in Vantaa) and Tuusulanjarvi (Lake Tuusula) (in Tuusula). Pack the 7th (Sun) with family-friendly diversions at Linnanmaki Amusement Park. There's much more to do: stroll through Sibelius Monument, wander the streets of Katajanokka, admire the masterpieces at Kansallisgalleria, and relax and rejuvenate at some of the top local wellness centers. For reviews, ratings, other places to visit, and other tourist information, read Helsinki itinerary planner. Krakow, Poland to Helsinki is an approximately 5.5-hour flight. You can also do a combination of bus and flight; or drive. Traveling from Krakow to Helsinki, you'll lose 1 hour due to the time zone difference. Traveling from Krakow in July, expect nights in Helsinki to be about the same, around 15°C, while days are slightly colder, around 25°C. Finish your sightseeing early on the 17th (Wed) to allow enough time to travel back home.